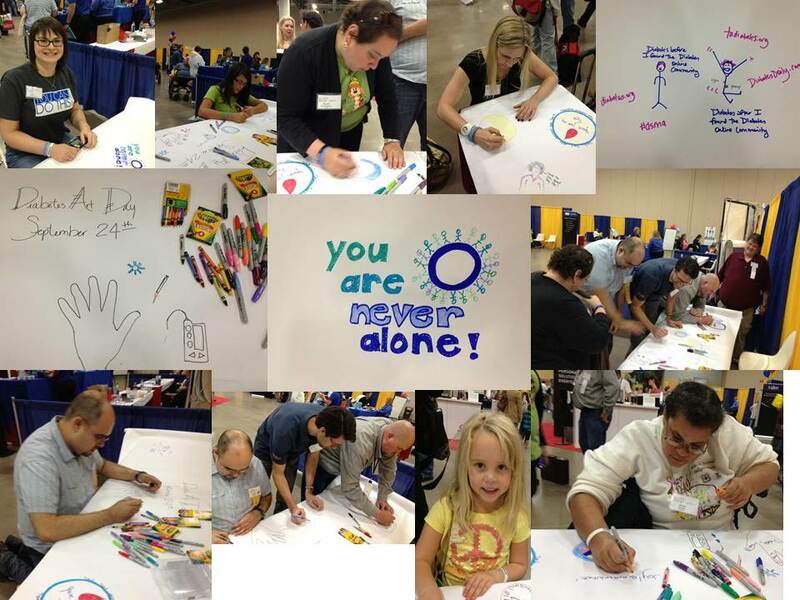 We attended a diabetes conference this past weekend and brought some art supplies with us. Toward the end of the conference, we brought the materials into the vendor fair area, and set up in an empty booth. Our supplies were simple: a long roll of paper, markers and crayons. I looked rather official as I was wearing the D.A.D. t-shirt. We then just asked people to come draw on the paper in honor of D.A.D. Most of our Diabetes Online Community (DOC) friends, jumped right in and participated. We had captured the artistic talents of Kelly, Mike, Scott, Jess, Ahmad, Chris, Nikki, Bea, Marie and of course, I drew a little something (or maybe 2). But, other than two children, one elementary aged, the other, perhaps Jr. High, we just couldn’t get any other people involved. I tried announcing to passers-by what was going on. “Come draw a picture for Diabetes Art Day!” “Good afternoon ma’am, would you like to participate in a diabetes art project?” Their responses were fairly typical of that which I’ve seen in the past. AND, for the record, NONE of these responses are being judged or considered wrong. . .just different responses from different people and always fascinating to me. The BEG-Me-to-Participate-especially with this project, I can’t tell you how many times I heard, “But, I really can’t draw!” Did you see what I did? Did you call that drawing? Really? Most of the time, we’re not looking for your artistic skills as much as your willingness to participate. The “I-have-no-idea-what’s-going-on-but-this-lady-said-to-draw-something”- Another child, older than the first, just wandered to the table and looked at it. I invited her to draw something for D.A.D. Without a thought, she dropped to her knees and started drawing, then just as quickly wandered away. As I looked to see her work, she’d drawn a rainbow colored peace sign. So who are you, and how do you generally respond to a participation request? Do you jump in immediately? Do you wait to be asked? Do you require MANY invitations to know that they REALLY want you involved? Do you pretend you didn’t know what was happening, but then feel left out later? Or, are you so busy with other things that you really didn’t hear the invitation? Were you so “over-burdened” with other things that you want to participate but feel you can’t? I think, faced with an invitation, most people respond as they are programmed. I, personally, am a jump in with both feet and find I’m in over my head kinda gal. If you offer me a chance to participate in something, I generally find a way to make it happen. However, I’m learning to temper that response a bit, now that I’ve had to realize my physical limitations. As far as D.A.D. is concerned, there are people who started projects months ago, and they’re just finishing them up. Others, just remembered today, that this is the day and they’ll scramble to draw something, tape something together or maybe take a photo and download it at the last minute. Some made plans to do one project, but ran out of time and did something else. .. (**me, for example**) It takes all of us, doing things the way we do them, to make any of these projects successful. To all you early-birds, late arrivals and think-tanks out there, THANK YOU for being a part of D.A.D. I go back, several times during the year to view the projects. You are all inspiring and I am grateful you were willing to share your story in a language that speaks to me! Babs, I know I told you a million times last weekend, but I’m SO glad you rocked the Diabetes Art Day so hard. You helped many of us get into it, together, which was way more fun. Thank you! I’m just so happy you were all so willing to jump in and participate! Thank you! Art really speaks to me, whether its a professional painting hanging in a museum or a child’s rendering of his family. . .it really says so much. Thanks Shannon, for reading and commenting. I’ll check out your blog as well. Have a great weekend!